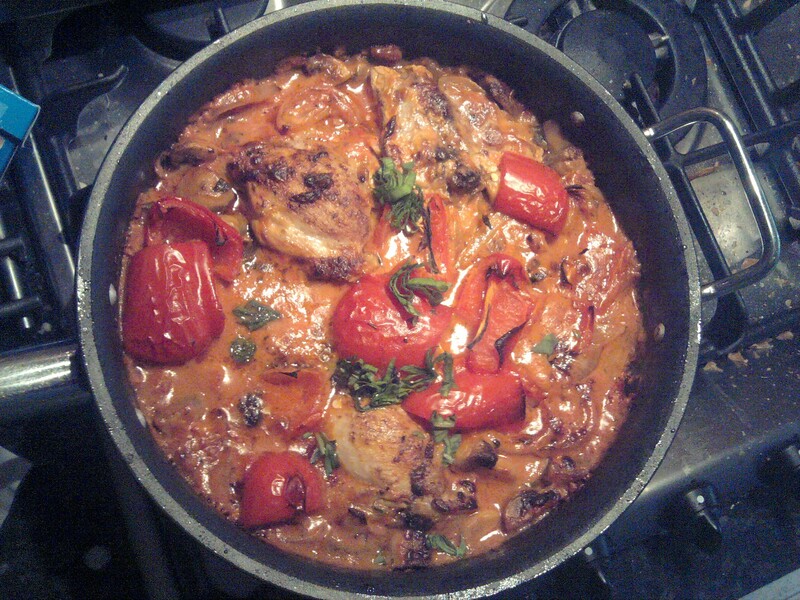 Poulet chasseur, Hunter’s chicken,… whatever you like to call it, the basic recipe is the same. I’m making the Italian version tonight, so using basil rather than the thyme and bay leaf I’d use if I was making the French version, or the sage I’d use to flavour a British version. 4 chicken breasts, bone in. In an oven-proof pan, melt a knob of butter. Add the onions and finely minced garlic and cook until softened/translucent but not browned. Set aside. Brown the chicken, and set aside. Sprinkle the flour into the fat at the bottom of the pan, then add the mushrooms. Lightly brown the mushrooms. Add the canned tomatoes and the mascarpone. Stir well. Mix in the onions and garlic. Add the chicken and top with the peppers. Bake in a hot oven (190C) for 20-30 minutes.